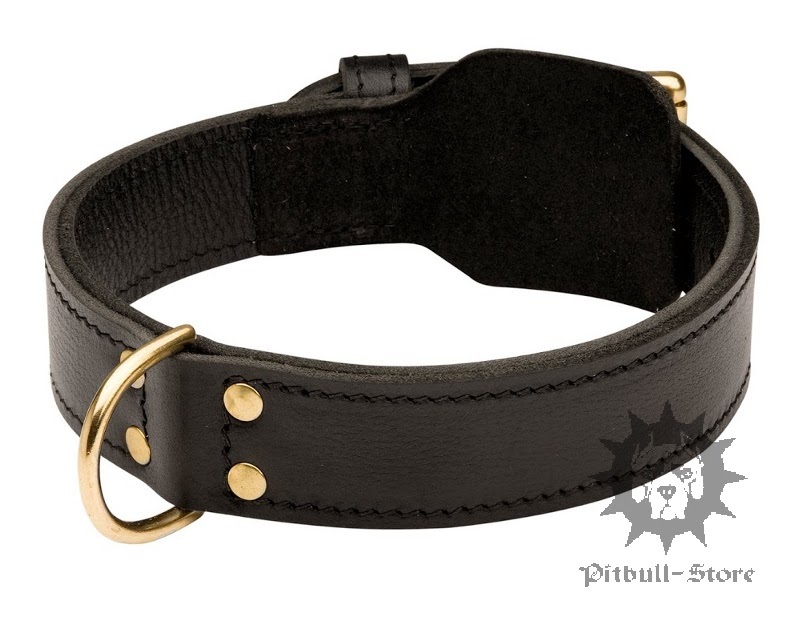 Are you still in search of an extra strong Pitbull collar? 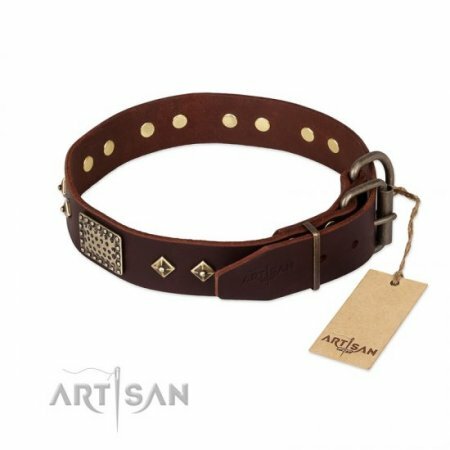 This collar by Fordogtrainers is the very thing your need for your powerful dog. 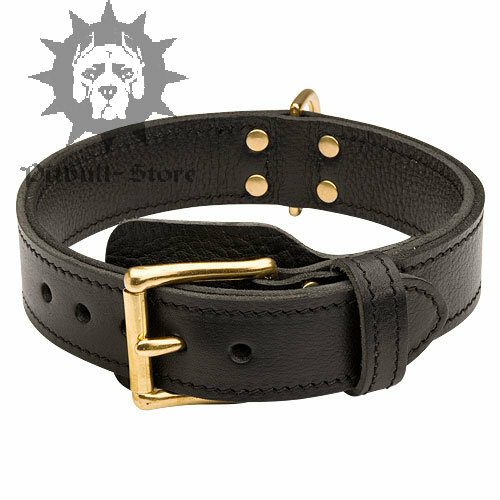 It is made by hands of double thick leather and fitted with sturdy hardware to be a resilient tool for your Pitbull control. Fur protective plate will save your dog's coat from damage and its neck from rubbing by the buckle. 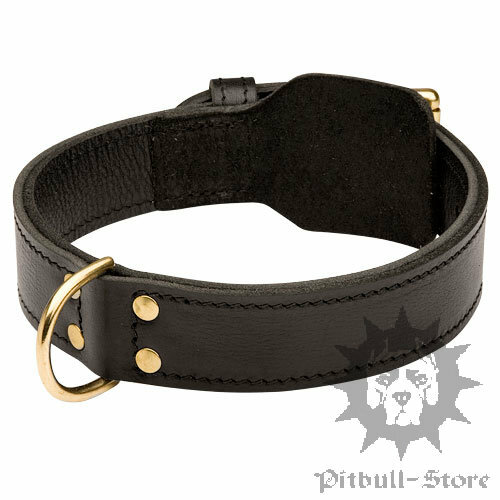 The collar serves for Pitbull training, walking and control. 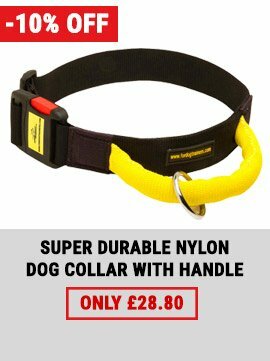 You will handle the dog with confidence using this collar! We have EMS-Express shipping (3-6 business days) and Registered shipping (6-12 business days) and deliver our products over the world. 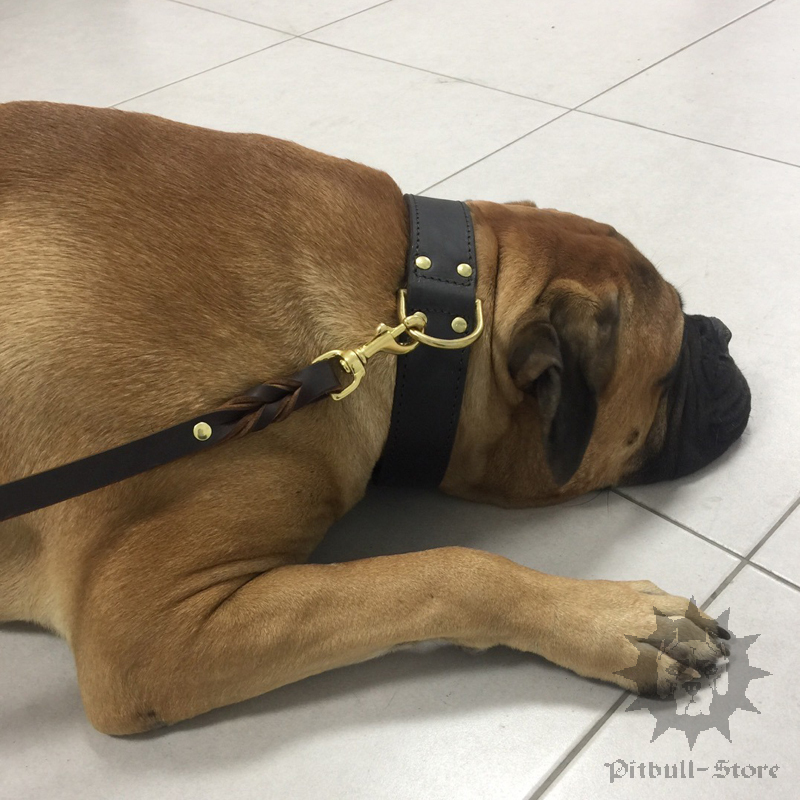 Contact us and our customer support team will send you the most suitable collar and will answer your questions. You can always return or exchange the product if it doesn't fit your Pitbull. There are special discounts and proposals for our loyal customers. 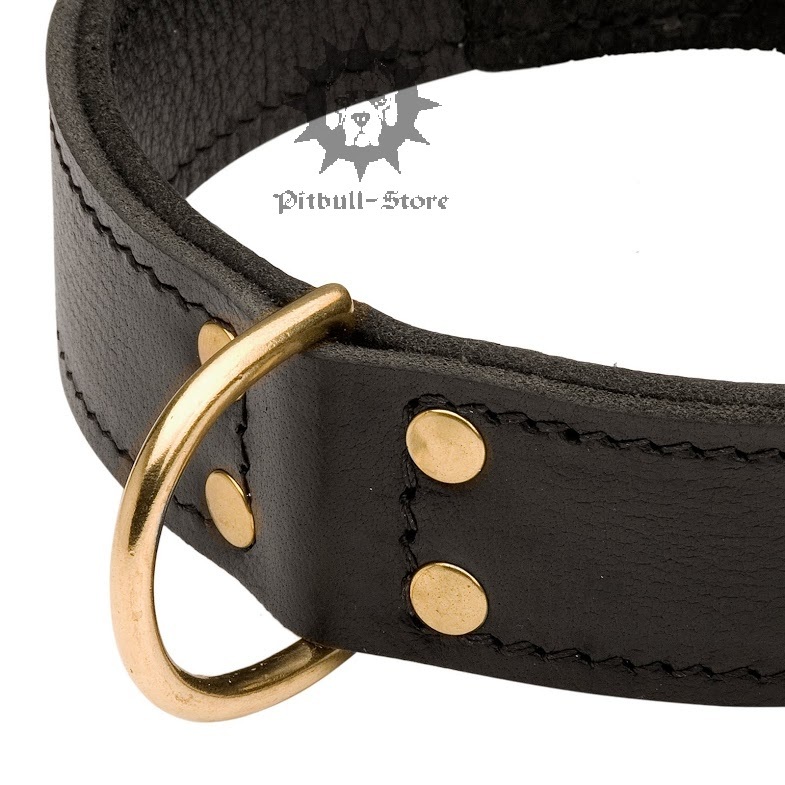 You will get the collar, which is chosen according to your Pitbull neck size. Bulk customers can test our products after order payment. Hi, I received the collar today just as described! The collar fits perfectly and looks great on my dog. The quality is a lot better than I imagined. 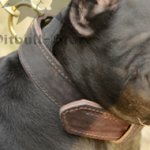 Truly the best quality I have seen for a dog collar. I will be telling my friends about you as well. Thanks again! 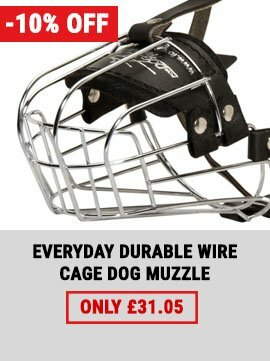 We use only the best material and technology to produce this collar and other dog training equipment for your Pitbull and Staffy. 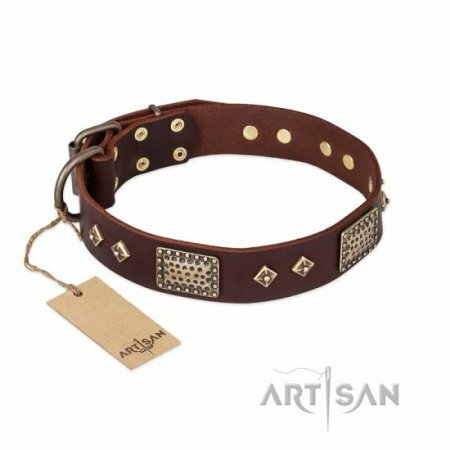 This agitation dog collar is even more strong owing to 2 ply leather it is produced of. So you may be sure, the collar is not going to tear. 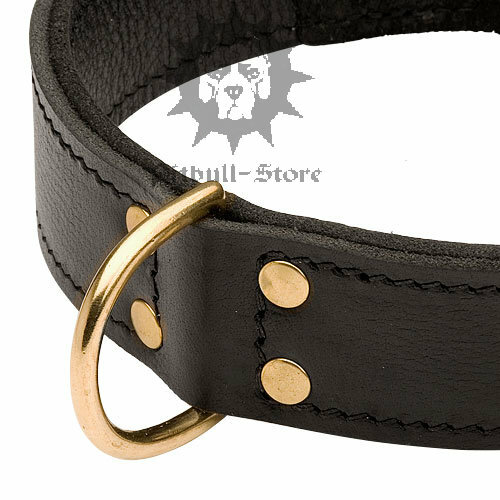 Nor will the furniture rust: the solid brass D-rings and buckles provide long life of our Pit Bull dog training collar. The fittings are solid and resistant to rust. 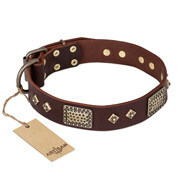 The dog collar has 5 eyelets at a distance of 0.9 inches (2.5 cm) from each other. The neck circumference of your dog will be on the first (A) hole in such two-plied collar, if it is unrolled. 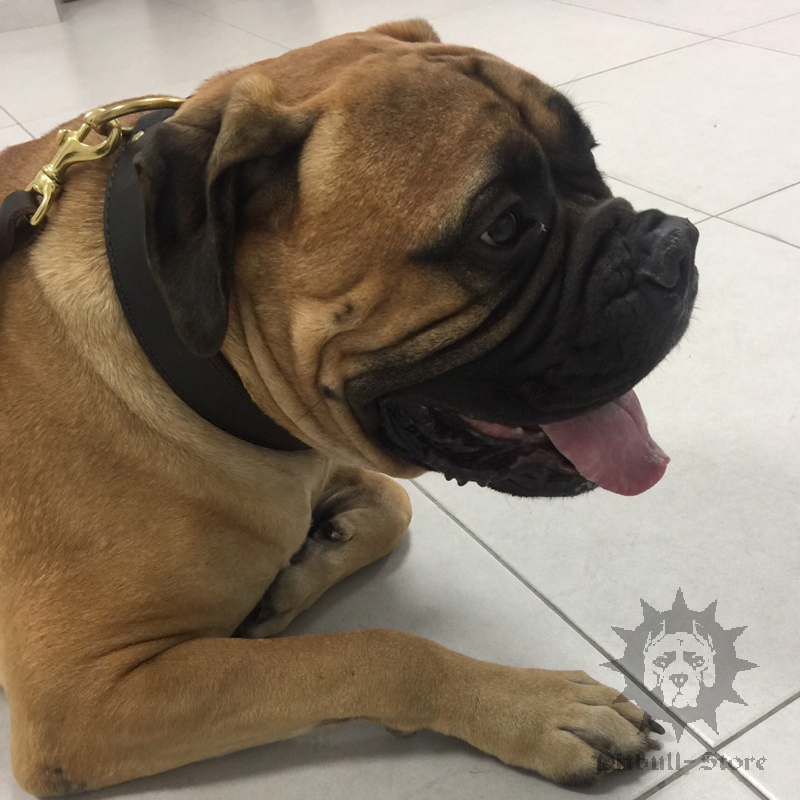 When the collar is fastened with a buckle on your dog's neck, the neck circumference of your pet will be on the second or the third (B or C) hole. 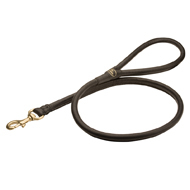 As such collars are made of two plied leather, they are thick and hard to fold. For example, the neck circumference of your dog is 19.7 inch (50 cm). If the first (A) hole is at the distance of 19.7 inch (50 cm) from the beginning of the collar in unfolded state, it will be fastened with a buckle on your pet's neck on the second or the third (B or C) hole. Please, pay attention, that a two-plied collar is very massive and heavy. 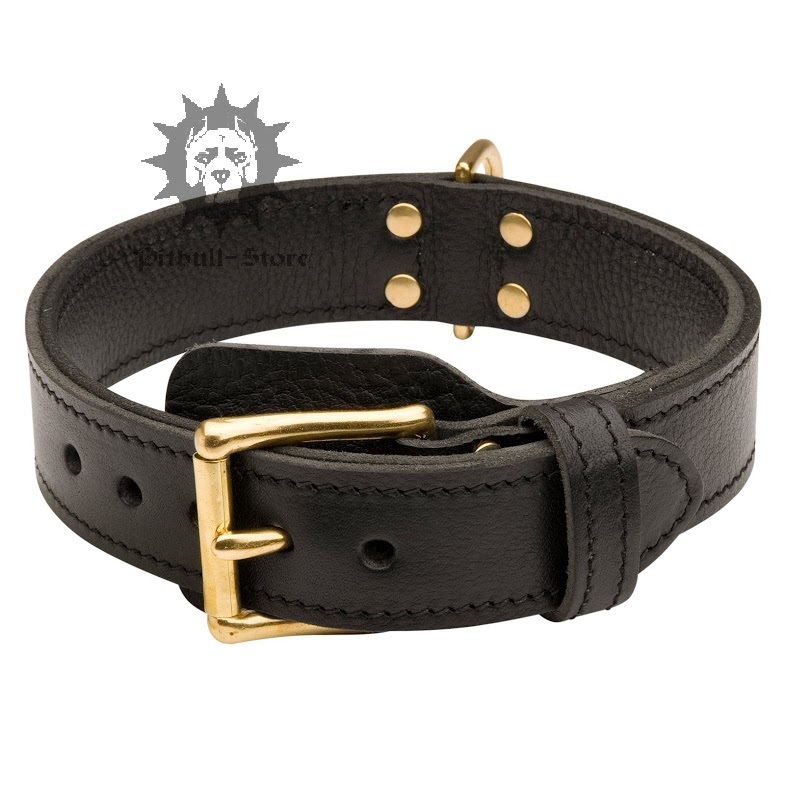 This Pit Bull leather training dog collar has a fur protection plate. Professional trainers know well that dogs can pull very hard during agitation training sessions. This may cause damage to the beautiful fur of your pet. That is why we included a fur protection plate into this model of training collars for dogs. The dog can pull as hard as it likes, don't worry about it's fur! 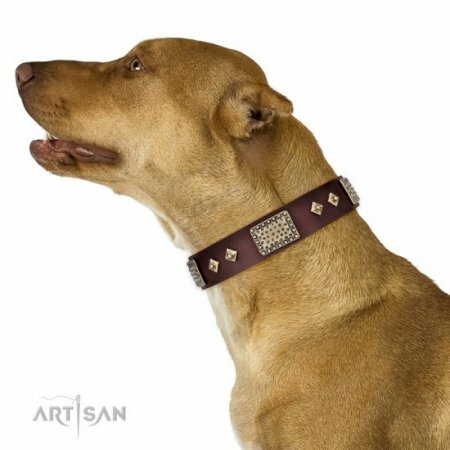 The 2-ply agitation dog collar fits for large and strong pets like Pitbull, Staffordshire Bull Terrier, Amstaff and similar dog breeds. 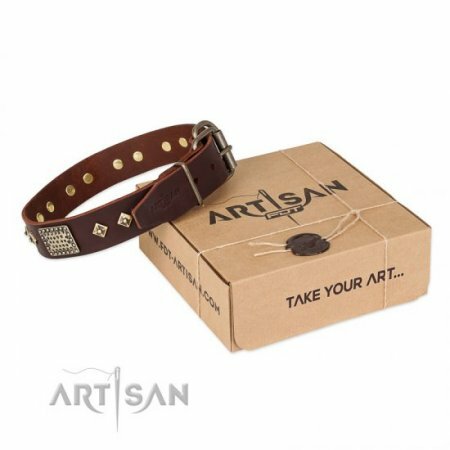 Provide special care for the training collars for dogs with our leather care balsam. 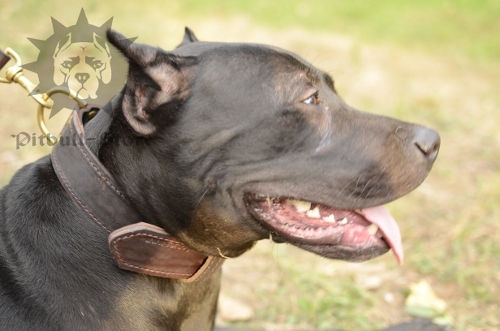 Look through our article about dog collars as an important Pitbull gear. The parcel has arrived, everything is OK. The collar is made very well, the photos on the site comply the product fully. TODAY! 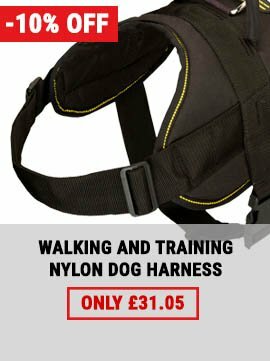 Easter Gifts for Your Dog with 15% OFF!